Michael Clarke's century is his third in eight matches in Brisbane. Greg Chappell holds the record for the most centuries in Brisbane (5). 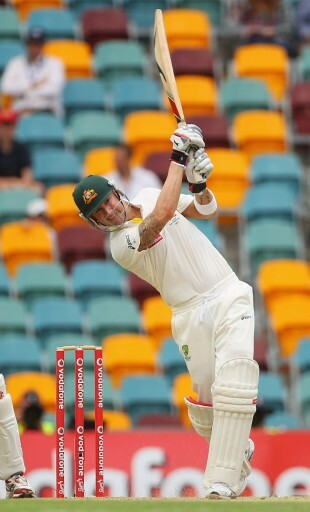 Among batsmen with 500-plus runs at the venue, Clarke's average of 82.12 is the fifth-highest. Clarke's century is his 17th in Tests and his fourth against New Zealand. It is also his second hundred against New Zealand at the Gabba and the third against them in home Tests. The 108-run stand between Clarke and Brad Haddin is ninth on the list of sixth-wicket stands for Australia against New Zealand. It is also the fourth-highest sixth-wicket partnership in Brisbane for Australia against New Zealand. Haddin, who averages 37.08 overall in Tests, has done particularly well against New Zealand. He averages 57.50 in five Tests against them with one century and half-century. Since his half-century in Melbourne against England, Haddin has scored 282 runs in 12 innings at an average of 23.50 with two fifties. This is the ninth time in 12 matches since 2000 that Australia have scored over 400 in the team first innings in Brisbane. Of the 11 previous matches, they have won eight and drawn three. There has been only one occasion when a team has gone on to lose a match at the Gabba after taking a lead at the end of the first innings. It happened in 1990, when England took a 42-run lead but went on to lose by ten wickets. After two hard-fought days at the Gabba, Australia tightened their grip on the Test on the third. It was through their leaders that they secured their advantage: the captain Michael Clarke scored his third century in four Tests and the vice-captain Brad Haddin struck an important and well-paced 80, after former skipper Ricky Ponting steered the middle order with his second consecutive half-century. By contrast, it was a day of wasted opportunities for New Zealand. Clarke was dropped twice, either side of his hundred, and both were regulation chances. He had already had a life on the second day when he was bowled off a no-ball. And the inability of the visitors to skittle Australia's tail could prove costly: Australia's lead was 50 when the seventh wicket fell, but by the end of the innings it had ballooned to 132. New Zealand had to face seven overs before stumps and things only got worse when Brendon McCullum edged to slip off the bowling of James Pattinson. They finished at 1 for 10 with Martin Guptill on 7 and the nightwatchman Doug Bracewell yet to score, and a mountain of work left ahead of them. After their top-order struggles in the first innings, New Zealand needed something from their senior batsmen. After all, Australia's key men had delivered. Clarke's 139 was the standout, his straight driving a feature of the innings as he latched on to anything that was too full from the fast bowlers. It was exactly such a shot that brought up his hundred, a punchy drive off Doug Bracewell, and it continued a fertile period for Clarke. His last six Test innings have featured three centuries and as full-time Test captain his average is 51.90. He had good fortune, dropped on 85 when his inside edge behind wobbled just enough to trick the wicketkeeper Reece Young, and then on 105 by Jesse Ryder at slip, both chances having come off the bowling of Bracewell. But Clarke made the New Zealanders pay for their mistakes, cutting and pulling well and striking 19 fours. His one six was a loft straight back over the head of the bowler Daniel Vettori, to bring up his half-century. Clarke went to tea on 139, with the chance to turn his hundred into a huge one, but in the first over after the break he was caught at deep square leg off a top-edged pull. The departure of Peter Siddle, who was caught at slip off Vettori with no addition to the total, could have sparked a tail-end collapse for Australia. But Haddin, who was named vice-captain in the absence of the injured Shane Watson, found support from Australia's two debutants as James Pattinson made 12 and Mitchell Starc played some strong pulls in his unbeaten 32. It was an impressive innings from Haddin, who was under pressure during the tour of South Africa until his half-century in the fourth innings in Johannesburg helped Australia to victory. He struck two sixes, including a monstrous slog over long-on off Chris Martin to bring up his half-century, but it was generally a composed innings from Haddin, who finished with 80. He was eventually out trying to clear long-on against the part-time offspin of Martin Guptill, but by then his 44-run stand with Starc had pushed Australia's lead into triple-figures. Like Clarke, Starc had a reprieve when he was dropped at slip by Taylor, and the mistakes could prove costly for New Zealand, who didn't manage to take a wicket in the second session. The only man who left the field during that period was the wicketkeeper Young, who couldn't get his gloves to a Vettori delivery that bounced and turned more than expected and struck him in the face. A bleeding Young walked off and Brendon McCullum took the gloves, unusually without bothering to put pads on, although Young returned later in the afternoon. The second session was especially disappointing for the visitors after they picked up two wickets before lunch as Ponting missed the chance for a hundred and Michael Hussey departed cheaply. On 78, Ponting was adjudged lbw to Martin, and despite a review did not survive, while Hussey's lean trot since his wonderful tour of Sri Lanka continued when he inside edged onto his pad and was caught at short leg off Vettori for 15. At 5 for 237, Australia still had some work to do to pass New Zealand's 295. They did it with ease. Now it's New Zealand's batsmen with the challenge ahead of them.